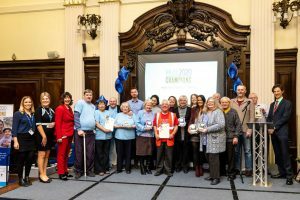 Here are some of the highlights from our recent Hull 2020 Champions Celebration and Awards event take place at Hull’s Guildhall presented by the CCG and Hull City Council with a total of eight category awards made. This year’s winners were chosen by a panel from nominations submitted by service users and the public. The Idea Award: Men in Sheds. “The winner of this award came up with an idea that benefitted a group of Champions living with disabilities. The group went above and beyond to create an adapted workspace for service users. Building adapted benches for the greenhouse, and benches in the sensory garden, these award winners went massively above and beyond – nothing was too much trouble and some members of the group even used their own time to finish the project. This has improved service users quality of life, and has meant that service users (often with complex physical disabilities) have been able to get out and enjoy the greenhouse and sensory garden without any issue,” said Dr Dan Roper. “Nothing is too much trouble to help our service users that have complex physical disabilities, I ask and they accommodate us as best they can,” said a nomination. “This award was to recognise the Hull 2020 Champion who has maximised every opportunity given to them through the Hull 2020 Champions programme. This award winner has successfully navigated the NHS landscape to be able to offer specialised support and care for people who have suffered, or are recovering from, brain injury. This award winner raises awareness and funding, through their networks, to be able to provide support to those in need. The team behind this charity go above and beyond, making themselves available to anyone in need at any time; with the founder of this fantastic charity often putting other’s needs before his own,” said Julia Weldon. “P.A.U.L for brain make a huge difference to peoples lives, the founder of the charity has such a passion for helping everyone, whether it be minor in helping people come to terms with their injury or whether it be specialist treatment like speech therapy,” said a nomination. “This award winner started small, offering a crafty cuppa for all ages, but the group have grown into a mix of men and women, from all walks of life, who are able to get together and grow not only the project but their own confidence too. The group regularly have 16 members attend, many of which are now volunteers with GRIN too, and are looking at ways they can expand to reach more people and possibly offer more activities, information and a social supermarket for the local community. This group is run by a group of around 25 volunteers, all who are said to be fantastic and give to the community in many ways; helping reduce isolation, promote healthy lifestyles and bringing the community together,” said Dr Dan Roper. “The GRIN motto is ‘If you see someone without a smile, give them one of yours’,” said a nomination. The Need Award: Emmaus Hull and East Riding. “This award aims to thank the Hull 2020 Champions who do the most to meet the needs of the people they work with, with this charity certainly working incredibly hard to meet the homeless community in Hull’s needs. Not only are this charity incredibly passionate about improving the lives of homeless people in Hull, but they are also dedicated to being ‘people focussed’. This Hull 2020 Champion group pride themselves on their ability to outreach, thanks to the human relationships they have built with the homeless community, and never see people as statistics. Every homeless person in Hull is exactly that to them; a person. A person with a life they can work to improve, by offering services to meet their needs. This group work with partners to address the often complex needs of their service users, including around mental health, substance misuse, education, victimisation and offering, employability, and more importantly long term safe accommodation,” said Julia Weldon. “They make it possible for people with nothing and believe they are unloved, to feel valued, useful and cared for,” said a nomination. The nominations for this were so good that this award was given to two winners. Nicola Smith, Hull Churches Housing Association. Lesley Bellerby, for Rooted in Hull. “They take an idea and find a solution – water collection, sustainable funding or accessibility – then share this with the wider VCS in Hull and nationally so it can help the maximum number of people possible,” said a nomination. “This award looks to recognise a Young Person who is involved with the Hull 2020 Champions who does their best to make a difference for others. This is a person who continually goes above and beyond, and works hard in ways many that perhaps their peers do not, leading campaigns to raise awareness of brain injury and stroke in young people. This person does not let anything get in their way, and has strength well beyond their years. This individual has been nominated, and won this award, down to their commitment and dedication to helping others,” said Julia Weldon. “This award has been designed to recognise an individual who has worked tirelessly to promote healthy lifestyles for people with diabetes. An unsung hero in the health community, this individual has organised and run a support group for those with diabetes for many years. This person takes an active interest in the work of the CCG, and how they can support this and help us to create a healthier Hull,” said Dr Dan Roper. “The winner of this award has been chosen because of their tireless commitment to helping those who have been affected by stroke. Not only does this group support stroke survivors in ensuring their health needs are met, they also help them with advice and guidance around finances, safety, education and accommodation. This group support stroke survivors and their families and carers, tackling isolation and giving them a voice. This group have made significant steps in improving the care for stroke survivors, not only creating a safe network of support, but also helping to forge strong friendships and a caring atmosphere. The volunteers behind this group are a force to be reckoned with; going the extra mile to help others despite their own circumstances and experiences with stroke. Together they make a big difference to stroke survivors,” said Dr Dan Roper.